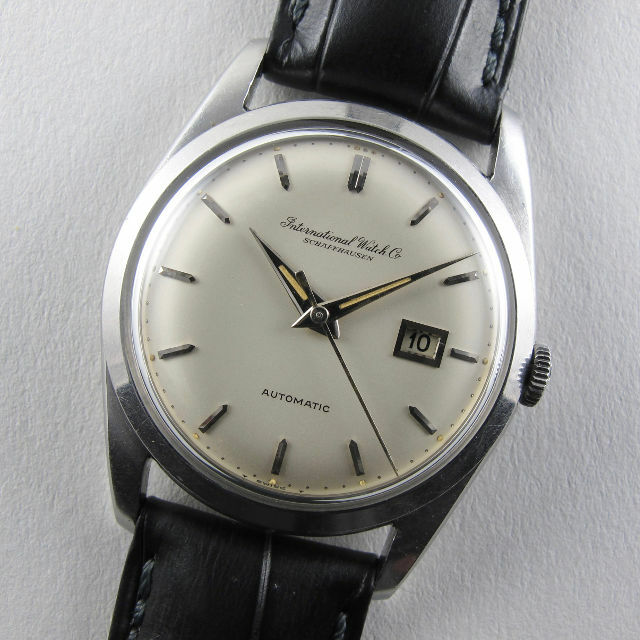 Opening this week’s update and pictured above is a superb International Watch Co. wristwatch which dates to c. 1963. The watch has a wonderful silk/matt silvered dial with applied faceted indexes. The surface of the dial retains an excellent colour and lustre and the luminescent accents above the numerals and panels to the hands have a warm and even tone. Cased in stainless steel, the watch has a classic chamfered bezel and there are finely down-turned lugs which have an unusually broad strap gauge. The watch is powered by the excellent IWC calibre 8531 which is beautifully finished with damascened bridges and rotor. 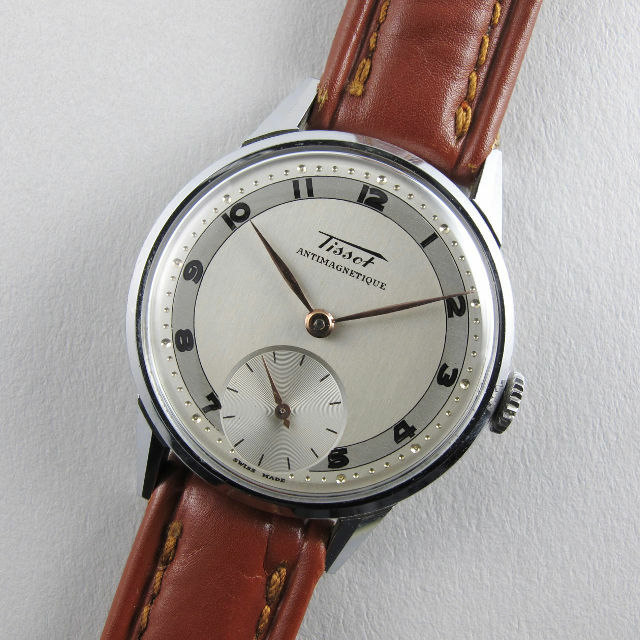 Next is a fabulous vintage Tissot Ref. 6424 from c. 1948 that is in outstanding original condition. The dial is quite exceptional with strong two-toning, a rich lustre, crisp pearled minute track and engine-turned subsidiary seconds dial. The Arabic numerals are executed in a pink gilded foil, are arranged radially around the dial and are toned to match the pink gilded hands for hours, minutes and seconds. The chromed upper case is wonderfully crisp with sharp chamfers to the bezel and the faceted lugs, the steel snap-on back has a presentation inscription which reads: ‘29.4.48 fondest love, Mary’. The vintage leather strap is fully stitched, appears almost unused, has parallel lengths and is fastened by a handsomely shaped broad pin buckle. Above is a Longines Ref. 22684 nickel chrome deck watch which dates to c. 1946. This watch’s case back is engraved with the Hydrographic Service code ‘HS 3’ which was used by the Royal Navy between 1939-1946 to denote a deck watch which had been adjusted for isochronism and in at least two different positions. The watch has a great utilitarian designed dial which is made in white enamel with black Arabic numerals and an outer track calibrated to half seconds. In common with other Longines military watches, the minute hand has a broad and angular lozenge form towards its tip to increase legibility. The nickel chrome case has a screw-down bezel and screw-down case back affording the watch greater protection against the ingress of moisture – an essential design element for watches intended for use at sea. Powered by a Longines calibre 19.70N which is in beautifully crisp condition. This Rolex Oyster Ref. 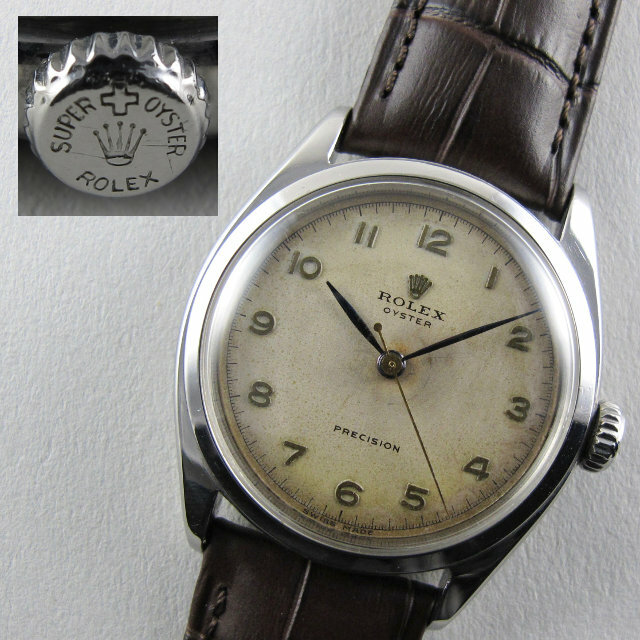 6022 model is fitted with a Rolex ‘Super Oyster’ crown. Introduced for a short period of time from c. 1951-1953, the Super Oyster crown was developed as an alternative water-resistant crown to the traditional screw-down crown that Rolex had first launched in 1926. However, any benefit offered by the Super Oyster crown was quickly perceived to be outweighed by the tried and tested water-resistance offered by the screw-down Oyster crown and production quickly reverted to the screw-down Oyster in c.1953. Many of the Super Oyster crowns were replaced with screw-down crowns during later servicing and examples of the Super Oyster models are becoming increasingly scarce. The Super Oyster crown acts in the same way as a standard crown and can be wound in the resting position. 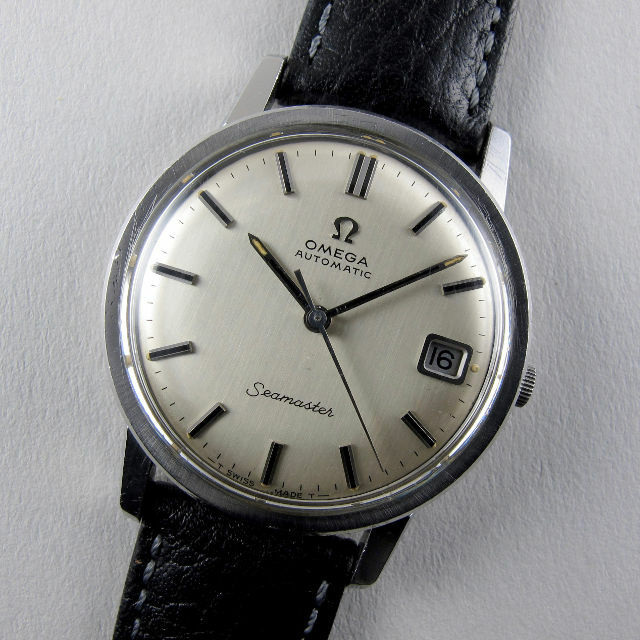 Pictured here is a smart Omega Seamaster Ref. 166.003 which was made in c. 1968. The stainless steel case has multi-faceted lugs which retain good definition to their angles and edges and the screw-down case back is centred with the embossed Seahorse motif, Omega’s emblem for their Seamaster line. The light grey silvered dial has a satin finish and both the hands and indexes have black inserts which help increase legibility. Automatically wound, the watch is powered by the 24 jewel, Omega calibre 565 which has provision for fast date adjustment via a secondary crown setting. 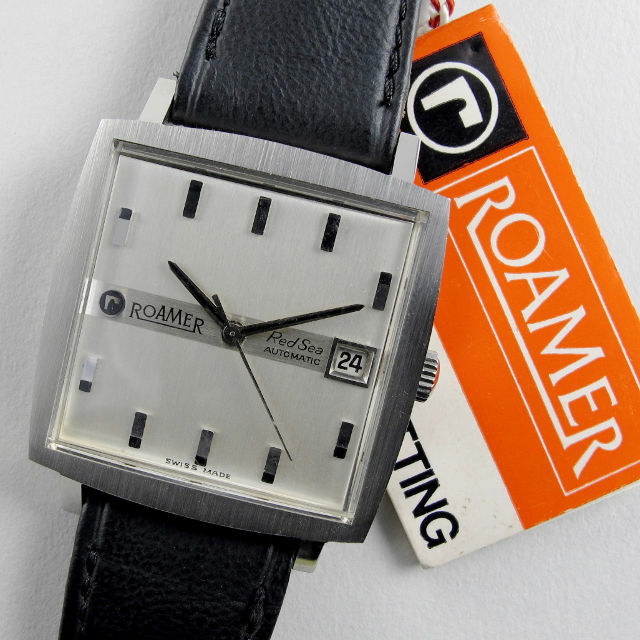 In excellent condition, the Roamer ‘Red Sea’ model shown above appears to be almost unused. Made in c. 1967, the case is sharp and crisp with strong detailing and delineation between the smooth and satin finishes of the case. The watch retains its original branded strap and buckle, Roamer swing tag and presentation case. Unusually for a square watch, this was a specially designed waterproof model. 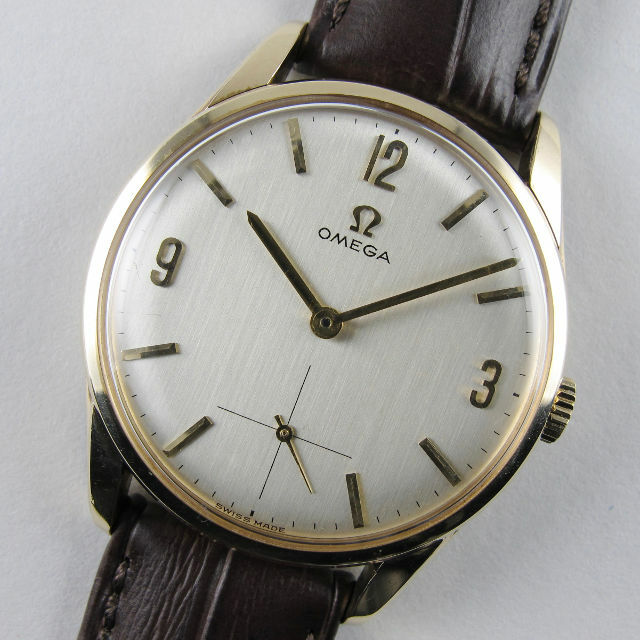 This 9ct yellow gold Omega Ref. 121.5400 has an attractive, bright silvered dial with vertical satin finish and applied gold Arabic and faceted baton indexes. Made in 1964, the watch is in lovely condition with a great lustre to the dial and only very minor oxidation to the surface. Manually wound, this watch is powered by Omega’s calibre 269 which is from the superb ’30’ series. Up next is a Zenith 3600 Ref. 230A from c. 1965 which is supplied with a Zenith presentation case. This wristwatch has a stylishly configured dial – rather than replacing the numeral at 3 o’clock, the off-set aperture for date allows all 4 quarter markers to be fitted with their unusual, lozenge-shaped indexes. The date window itself is asymmetrically shaped, naturally following its allotted sector of the dial. Cased in stainless steel, the watch has a screw-down back and the bezel is almost flat with an extremely shallow and almost imperceptible chamfer. 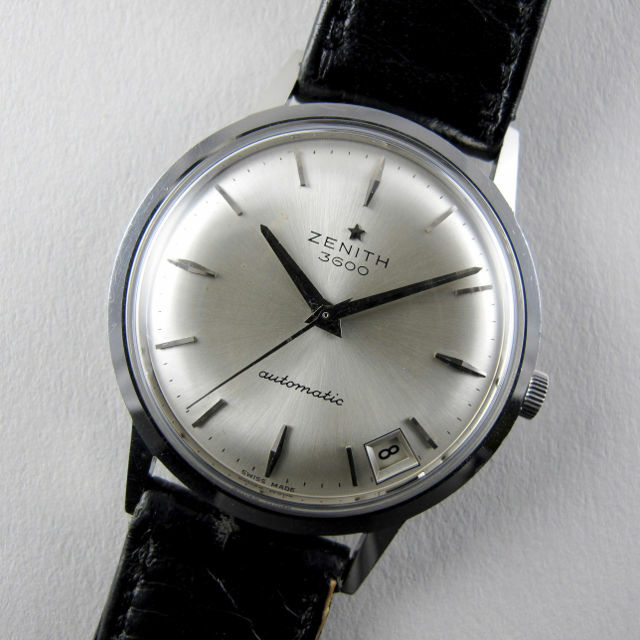 Automatically wound, this watch is powered by Zenith’s calibre 2532PC movement. 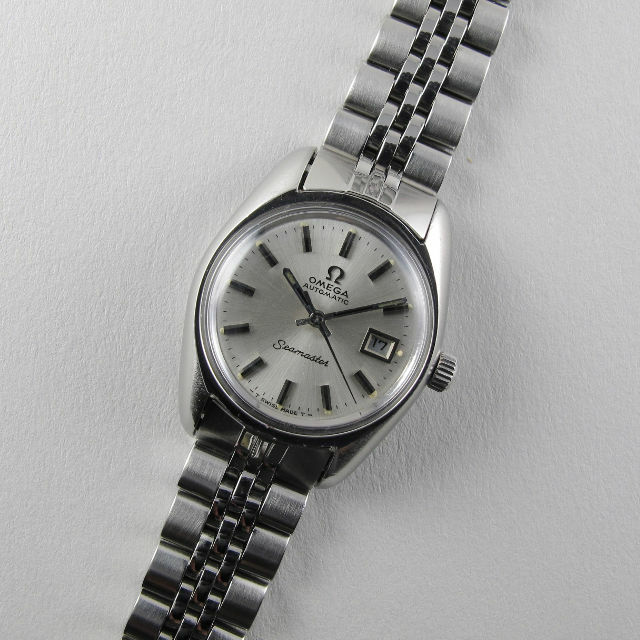 Above is a lady’s Omega Seamaster Ref. 566.026 from c. 1970. This classic lady’s model has a solid upper body with satin finished rounded lugs and separate screw-down case back, which is centred with the embossed Seamaster emblem. The watch is automatically wound via the Omega calibre 684 which has provision for semi-quick date change; whilst the date will change each day around midnight, it can be manually advanced when required by repeatedly moving the hands between 9pm and 1am. The silvered dial has applied indexes with black inserts which enhance legibility and the watch is fitted with its original polished and satin finished link bracelet with adjustable folding clasp. Made in 1956 and in wonderful condition, the Elco wristwatch shown here has a very attractive 9ct yellow gold case with sharply chamfered bezel and crisp, splayed lugs. The silvered dial has raised, gilded Arabic and lozenge-shaped numerals and an outer ‘pearled’ minute track. 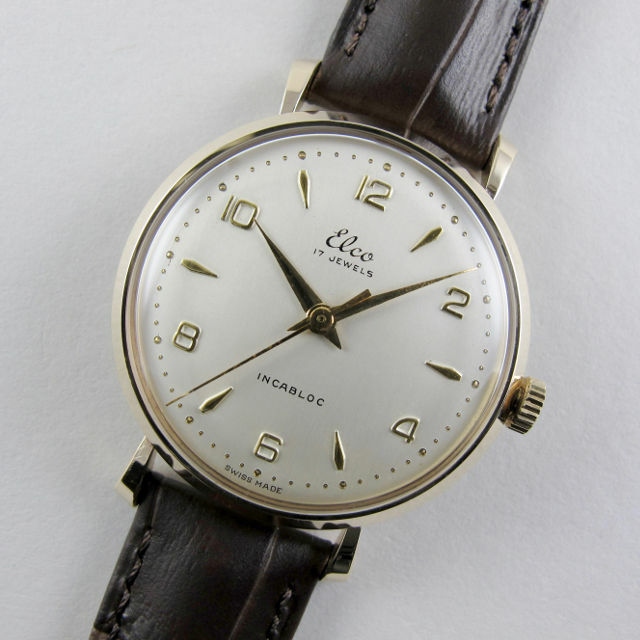 Elco was a sub brand of C. Ruefli-Flury & Cie, a watchmaking firm based in Bienne, Switzerland. 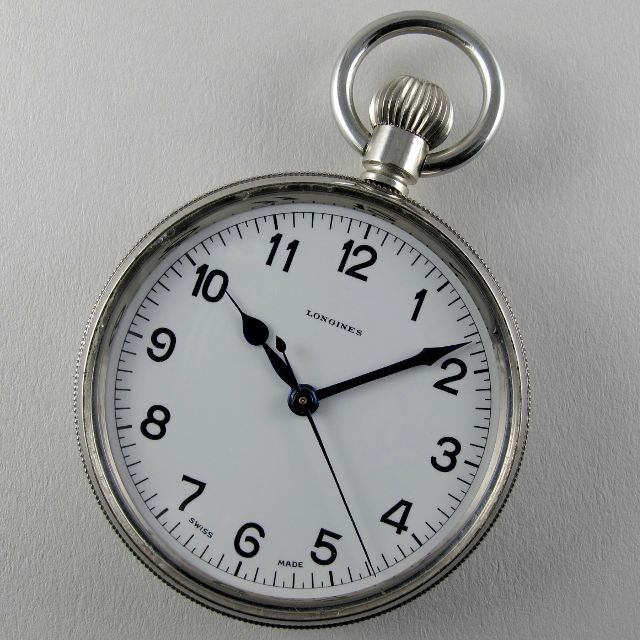 Elco watches were imported into the UK by Elco Clocks and Watches Ltd of London. As with many other manufacturers of the period, the gold case was made and supplied in the UK and in this instance, was directly produced by Elco themselves; their stamp of ECW, for Elco Clocks and Watches, can be found to the top of the inside case back. 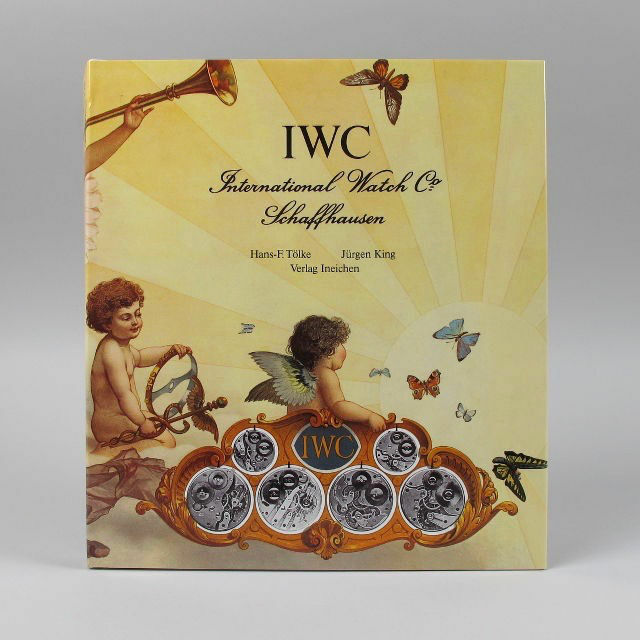 There’s a rare opportunity to purchase a new/old stock unopened example of the English language 1st Edition of ‘International Watch Co. Schaffhausen by Hans-F. Tölke & Jürgen King – this is an important work on the history of IWC that was published in 1987. Recently discovered in a warehouse, the book is still in its plastic seal and contained within its card slip case – the internal photographs shown here are from our file copy – the book supplied is that shown in the plastic sealed photographs on the website. To automatically receive these updates via email, you can do so here: Subscribe – or by selecting the ‘Join Our Mailing List’ button at the bottom of any of our web pages.